This post brought to you by Cabot. As always, all opinions are 100% mine. 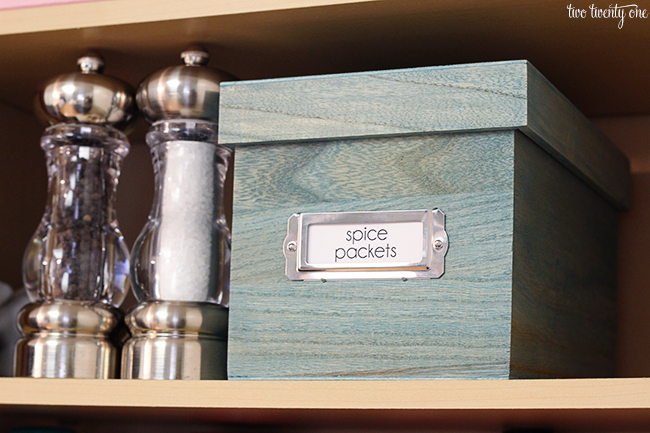 You may remember at the beginning of the year when I organized our kitchen spice cabinet. Well, I’ve been on another kitchen organizing kick– mainly due to our kitchen cabinet makeover. 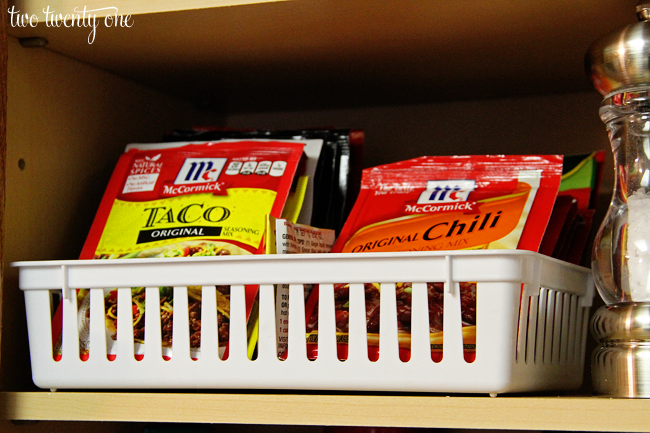 One thing I wanted to edit was my spice packet organization system. And I’m proud to say that it only took a few bucks to make it happen. First, let’s review how I initially organized the packets. While this system was fine, it took up too much space, width-wise, in our cabinet– precious real estate. I wanted to go with something narrower and longer so I could take advantage of the depth of the cabinet. I came across this box at Michaels one day– it even came with the bookplate. The box was the perfect size, and I had a 40% off coupon so it was less than $5. The box was pretty boring, as you could see. 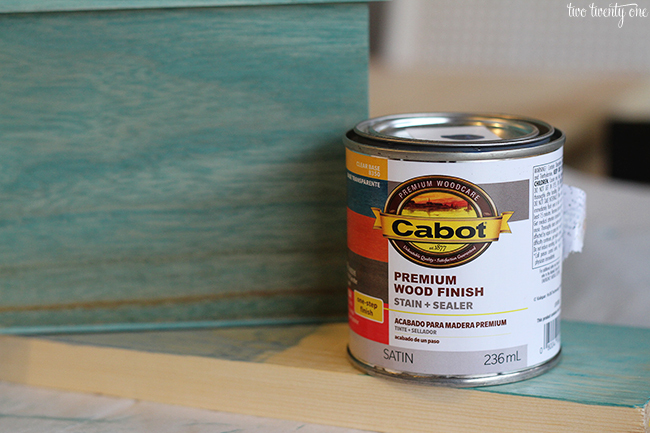 So I grabbed this great Cabot colored stain (I used the color Scuba) to give it a little character. I loved using this stain because I was able to add color to the box without having to deal with painting it– which would have taken longer. 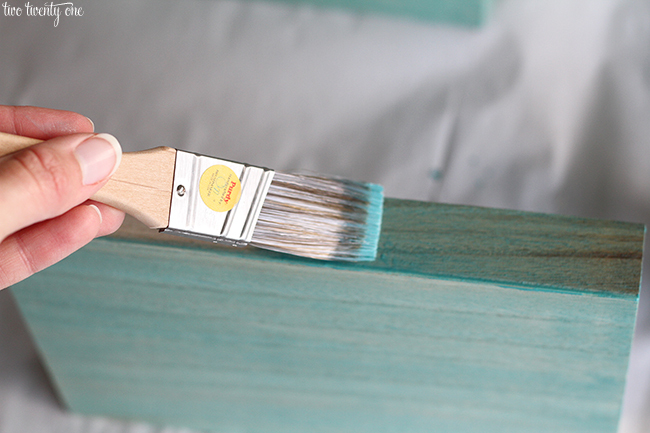 Stain is also great because, if done correctly, you don’t see brush strokes. Stain is very forgiving. In case you’ve never worked with stain, you brush it on with a regular brush, and wipe off any excess stain with a rag. As always, be sure to read the instructions on the side of the stain before starting your project. I only did one coat, which took about 10-15 minutes to apply. I let it dry overnight, and it was ready to go the next day. I love how you can still see the wood grain, but the box has a pop of color. The box is the perfect width for spice packets. It’s easy to flip through the packets and find the one I need. I like how the box is cleaner looking than my old method. Now all of the colorful, and somewhat busy, packaging is hidden inside the box. What do you think of this organization system versus my old system? 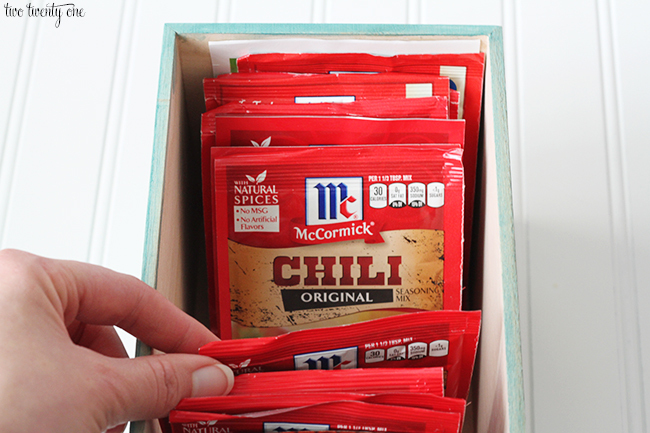 How do you organize your spice packets? Have you ever worked with colored stain before? Cute idea. I like the color you chose for the box. I have only bottles of spices, no spice mixes, but for those who do have spice packets, this is a good idea. 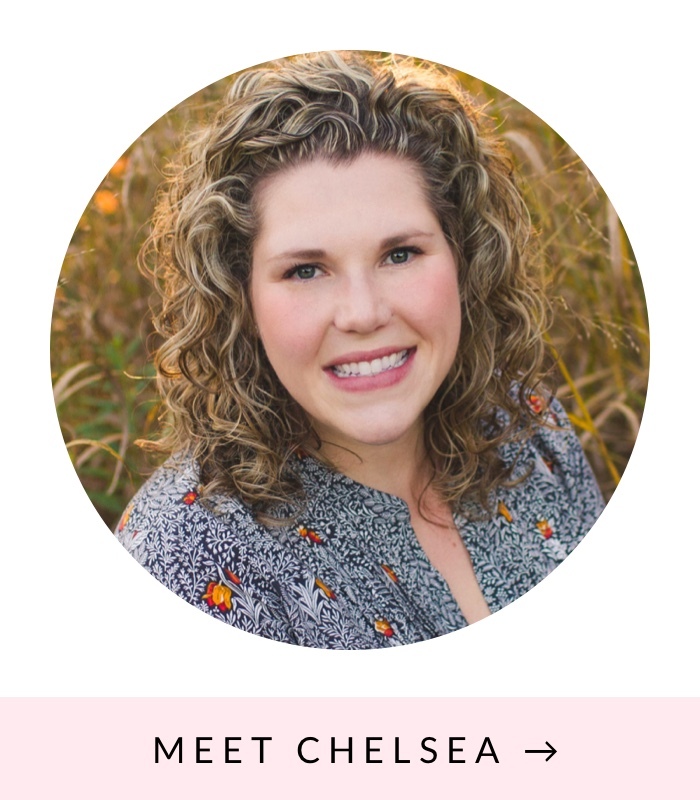 I had NO idea that color stains existed – where did you purchase yours? 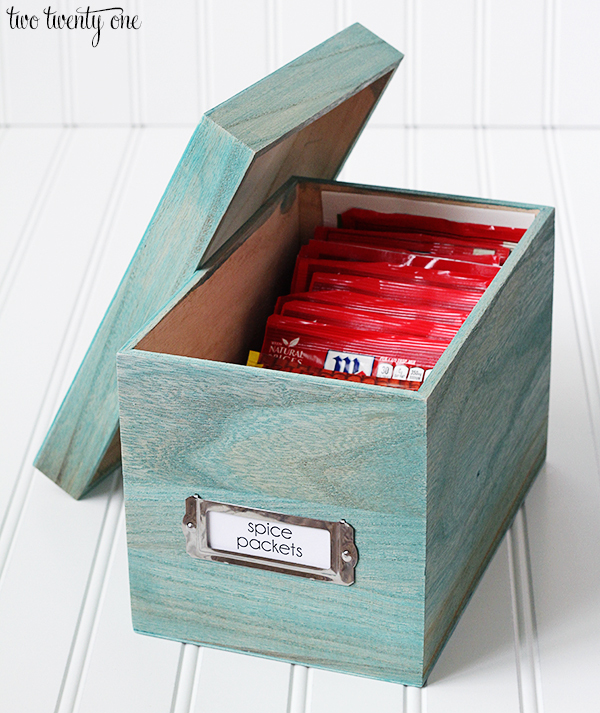 I currently have our spice packets organized in a clear circular container with a lid which doesn’t take up much space…but this is SOOO much cuter and sounds like an easy project too! On a side note, what kinds of spice packets do you use most? Looking in my container I am only seeing taco seasoning haha. Isn’t it neat?! You can purchase it at Lowes. I mostly use taco seasoning (beef and chicken), chili, and country gravy spice packets. Cute idea! I really need a better system for our spice cabinet… I got hit in the face with parsley the other day. LOVE this idea! 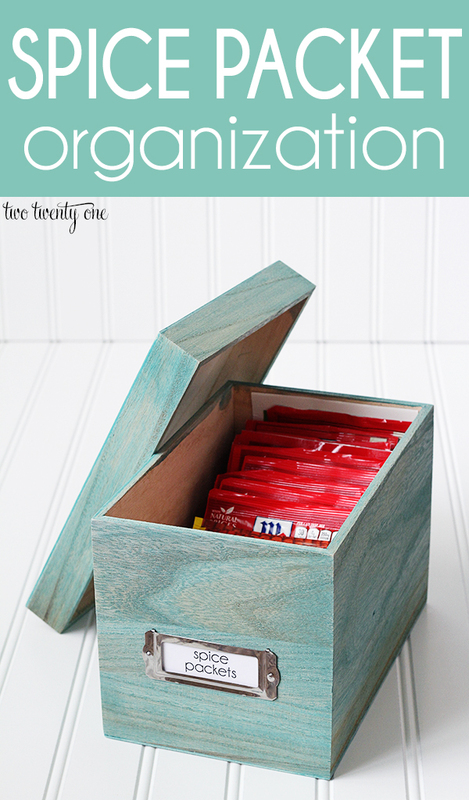 Super cute, cheap, and definitely helps organize. I might be heading to Michael’s to pick up a box just like it! Super cute! I love that blue stain – I’ve never seen a color like that before. I use a very fancy Ziploc bag for our spice packets. I may need an upgrade. Super cute! I love that box! I put all of our spice packets in a clear storage container that is about that same size. I love keeping them organized! I’m actually looking at staining my Alder wood front door blue but haven’t seen anything like that anywhere. My husband says it’s a sin to paint a wood door like that, so if I want color, it has to be stain. I’m thinking newport blue, and I want to do shutters on my house the same color. 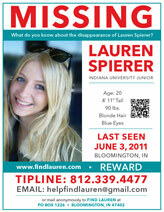 I really need to see it in person. 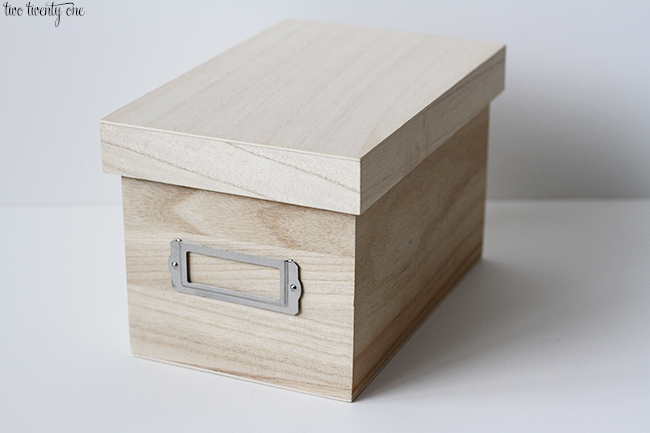 As for your cute little box, I would love something like that for my seed packets. What are the dimensions of the spice packets box? I love your idea. I’m going to do this for my spice packets. I love to be organized. I love the color but I will do mine in a teal..